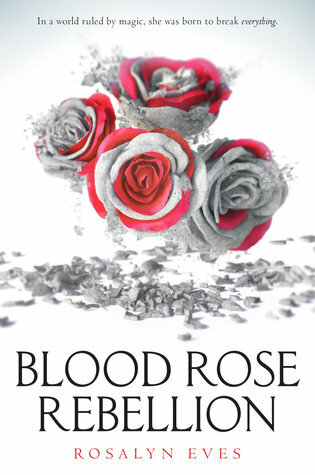 Filled with a highlight of gray areas when it comes to good and evil, Blood Rose Rebellion is a complex tale reminiscent of dystiopian novels like The Hunger Games and Red Queen. Sometimes, when I find myself getting so excited about a book, despite some of the disconcerting comments about why it was not finished by other bloggers, I get so so so excited that the idea of actually reading the book terrifies me. Its’s that way with any hyped book, though. I find myself devoured by it, unsurprising of course, but devoured none the less. Blood Rose Rebellion did just that. It pulled me in, under, and over. I found myself loving this book the longer I held it in my hands. Blood Rose Rebellion was a fantastic story about having to choose between a rock and a hard place. Anna, the protagonist, is a mixed bag. She is her own person, she is different, yet she also wants to be just like everyone else. Only the highest members of her society are able to wield the highly coveted and controlled powers of magic. Anna herself has no magic, despite her high status. Rather, she is something rather… odd. She can break other magic user’s spells just by being near them when cast. When her family ships her off to Hungary, Anna is tracked down by some rebels and asked to aide their cause. Break the barrier? Or remain loyal to a system that is beginning to fail her? Anna finds herself stranded and unable to decide which side is in the right… if either side even could be. Anna was interesting. I don’t know if I quite identified with her, or if I was simply curious about what was going on and how it would affect her. I don’t know if I actually cared. I know I was curious, and that I wanted to know what was going to happen – but I didn’t feel a strong emotional connection. This is probably the only reason this book wasn’t a total knockout for me. Everything else was fabulous, except for Anna. I just felt like Anna was passive yet also impulsive, which just doesn’t mix well. It’s inconsistent. Often, it felt as if Anna were selfish. Her impulsive behavior usually got everyone but her into trouble. Impulsiveness can work in a character, if it is consistent and if they have other attributes balancing it out – or even if they grow out of it in some form (Like Rose Hathaway – model character growth). Long story short, I didn’t connect with Anna. I actually wanted to smack her with a folded chair. I was interested, but not invested. However, the complexity of everything else carried the book for me. Nothing was black or white, every choice was morally gray. When you know neither side is truly right, which side do you choose? I loved that there were merits to being both a rebel and on the side of the Luminates. The choice wasn’t easy. It wasn’t clear cut. Yes, we can figure out what side should be chosen, but it is also hard to fully agree with either decision. It was unbelievably realistic. I enjoyed that it wasn’t a clear cut choice, it was more like someone forgot to flour the cookie-cutter and decided to cut the dough anyway. It makes for ugly cookies that still taste divine. Overall, Blood Rose Rebellion is a mix of sugar, spice, and things that aren’t so nice but you like it anyway. If you can get past Anna’s base nature at times, you’ll find yourself hopefully enjoying this book as much as I did. Also, there is a glossary in the back of the book – and I wouldn’t have been able to read this book without it. I recommend giving Blood Rose Rebellion a serious try.